We’ve all been there: despite the best intentions to cook our own healthy meals, we get sidetracked by… well, LIFE, and then find ourselves eating out far too often. Not only are we eating unhealthy, but we’re spending way more money on food than we’d like to. One of the greatest solutions is to plan out your meals ahead of time. In this meal planning guide, I’ll walk you through how I go about doing just that. This practice has overhauled our eating habits and almost completely eliminated the dreaded “What’s for dinner?” question. The key to staying on top of meal planning is to plan in advance. This means mapping out your week before you go grocery shopping and trying to make it a regular practice. Every week, set aside some time to look forward and map out your meals. I typically do this on Friday afternoons since that’s when I plan the next week’s work goals and activities. We typically go grocery shopping on Sunday morning, so I always have enough time to make the plan and confirm my fiancé’s commitments for the next week before we hit the store. For more inspiration on planning out your weeks, check out my post on the best way to use an electronic planner. The next step is to create some type of system or template to capture your meal plan. Ideally, you want to pick something that works for you and anyone else you’re meal planning with. 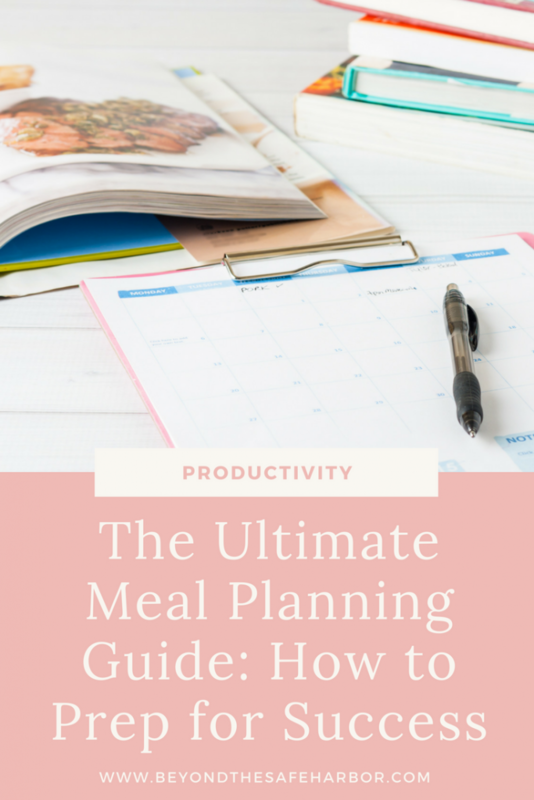 Give some thought to how you normally manage your to do list and calendar, and see if there’s something similar you can apply to your meal planning. If the system works well for you, you’ll be so much more likely to use it! 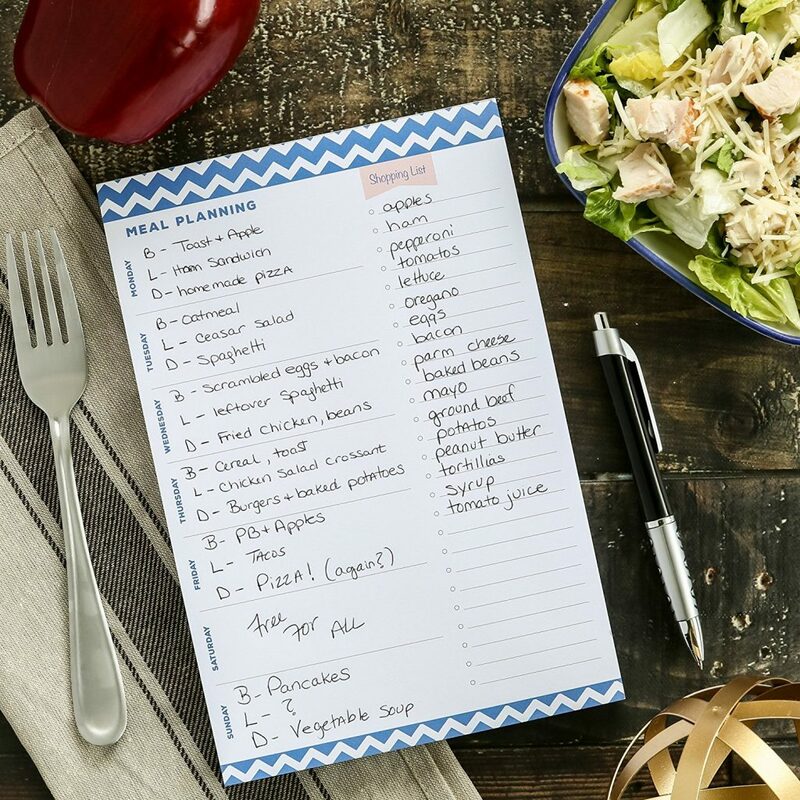 Grab a meal planning notepad like this one (pictured), and use a new sheet every week to plan your meals. You can keep this by the fridge for everyone to reference. For something more eco-friendly, try a dry erase board like this one (pictured) and keep it on the fridge. If you already use a calendar or planner (especially as a family! 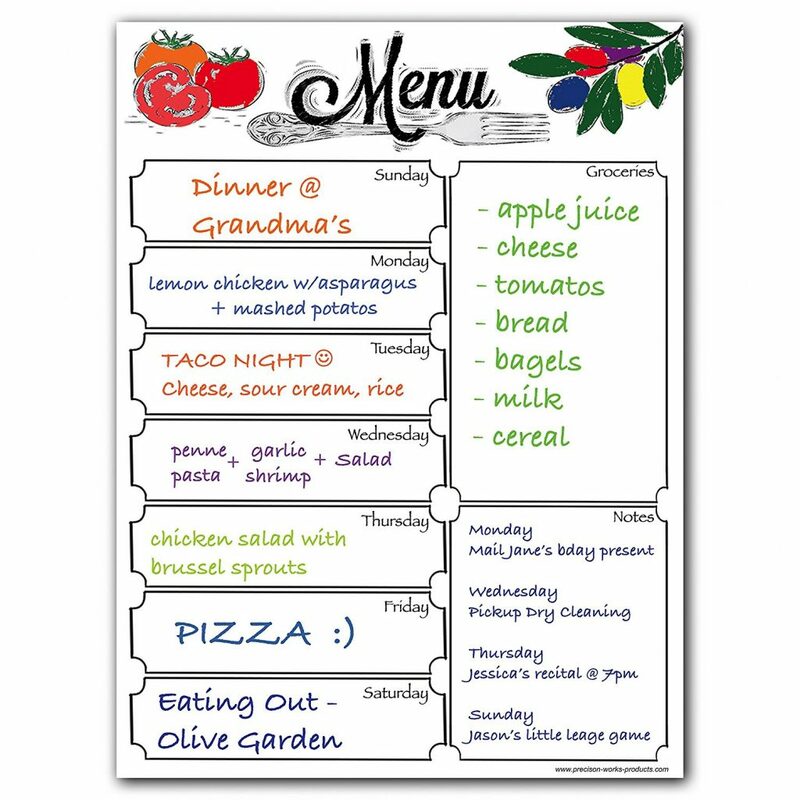 ), you can add a section to write in the week’s meals. This is what I do which lets me see everything in one place. Depending on the week, I use either a new task in Asana (a Project Management program) or the Apple Calendar (see how I use it here!). That way, when I’m looking at the day’s tasks, I know whether I have a dinner that involves a lot of prep or any food defrosting. Once you’re in the Resource Library, look under the Planning and Productivity section. Once you have your template set up, it’s time to start filling it in. If you have any existing meal plans like work lunches, dinners with friends, or trips, write those in first. And if you think you’ll have leftovers from them, write that in too! For example, almost every time we come back from visiting my fiancé’s parents, we bring home an extra meal or two of food. We can then plan to use that for upcoming lunches. In that case, I’d write “Away” for the meals we’re gone for, and then “Weekend Leftovers” for the two lunches following. If you have any meal kit deliveries (like Chef’s Plate or HelloFresh) or recipes already planned, start by slotting those into the respective days. We typically get meal kits delivered on Mondays, so that takes care of dinners for the first few days of the week. Planning on cooking something specific on a certain day when you have more time? Slot that into the week! Once those are included in your plan, look for patterns in your week. By patterns I mean anything notable that sticks out from your remaining meals. For example, are there three days in a row where you need lunches to be planned? Maybe you want to cook a large dish you can pack up for those meals. Do you have only one empty slot on a Wednesday? Maybe plan to buy your lunch if it’s a one off. Based on this, fill in any gaps. Typically, if we have a week without meals planned, I’ll prepare a few things on Sunday. If the week is pretty packed and there’s a random lunch with nothing planned, my fiancé may reach out to a friend to see if they want to meet up for lunch that day. (I work from home, so I can always grab something frozen in a pinch!) With this plan, going out to eat is more deliberate instead of the routine. Need help brainstorming meal ideas? I like browsing Pinterest, AllRecipes, and Genius Kitchen. For lunches, I’ll search Pinterest for “healthy lunch ideas” or ask my fiancé what he’s in the mood for. We have some go-tos like wraps and sandwiches that we can fall back on to. With those steps in place, you’re set for the week ahead! Now you have a complete meal plan! Use that to make your grocery list for the week, shop, and prepare anything you can in advance. You may also want to put reminders in your calendar for any food you need to prep or defrost throughout the week. If I’m making a crock pot meal, for example, I’ll block time in my calendar to do so. If it takes 8 hours to cook and we’re eating at 6pm, I’ll block 30 minutes from 9:30-10:00am to prepare everything. I also set reminders for defrosting food like frozen chicken. This means no scrambling or surprises later! How do you typically go about your meal planning? Do you follow steps like these or do you have your own strategy? I’d love to hear it! And be sure to check out my post How to Use Batch Cooking to Save Tons of Time for some ways to make your cooking efforts go further.